After a late night raiding, David wanted to sleep in but complained of the light waking him up. He joked he needed an eyemask like mine, although his needed something 'loveydovey' on it! 'Oh, I could do that' I said and this is what I came up with! I decided to use some left over red cloth that is like that brushed cotton, nice and soft. I thought that would make a nice sleeping mask. I considered cutting out lovehearts and sewing them on where the eyes should be, but knew that shape is tricky to hem and not have fray. 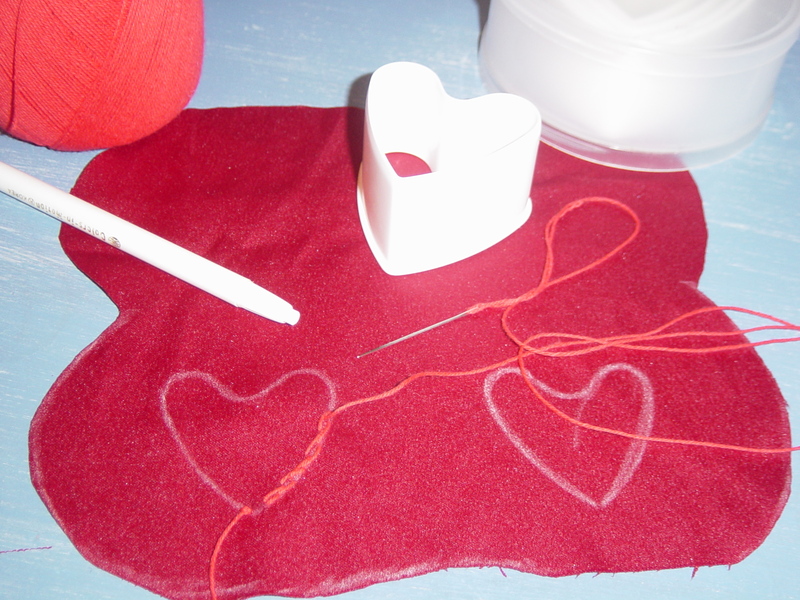 I came up with the idea of using a simple embroidery backstitch using loveheart cookie cutters as the template. But what could I use to draw the shape onto the material? Most pencils and pens would not work, and a permanent marker might show through to the other side. What I needed was some white chalk ... I used to have some stashed away, but I hadn't seen it in a while so I must have gotten rid of it. Then I remembered the set of screwup children's crayons I had in the guest room. Why would they have put white crayon in a child's colouring set, I had wondered. Well now I know. So I can use it for my sewing!! It worked perfectly. To make this sleeping mask, I used one I already had as a template. 1. Using an eyemask as a template, cut a shape that is twice the size with the top being the fold. Leave a good inch for the seams. 2. Embroider any pattern or words you want on one side, draw any outline on the wrong side of the cloth. 3. 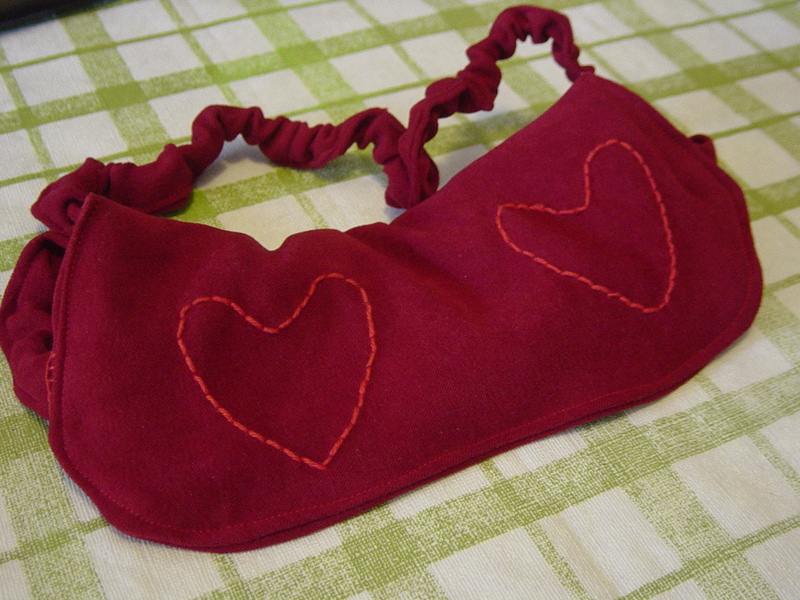 Fold in half with the wrong side of the cloth on the outside, and machine sew down one side and along the bottom. 4. Turn in the right way and place a layer of packing sponge inside. 5. Turn the opening inside and machine sew the edge, keep going around to the other side so it looks even and neat. 6. Cut a 2 inch wide strip of matching material, fold the edges in and sew on the right side, making sure there is enough space inside the tube for a safety pin. 7. Measure the length of elastic you'll need to fit comfortably around the wearer's head, use safety pins to pin the elastic to the mask to get an accurate measurement. 8. Using a safety pin, thread the elastic through the thin tube (use a large safety pin at the other end of the elastic so you don't loose it inside). 9. Use safety pins to pin the covered elastic to the mask and recheck your measurement just to be sure. 10. 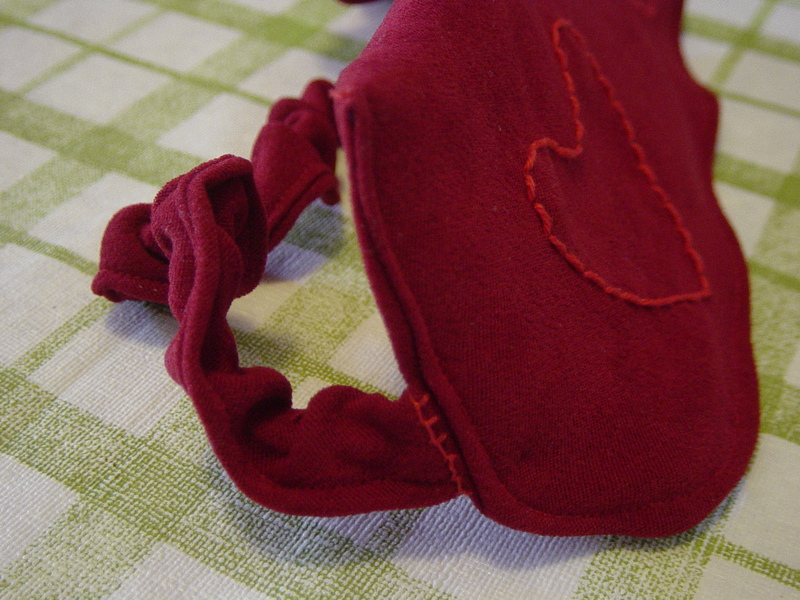 Hand stitch the covered elastic to the eyemask, about halfway down each side.